Easter Surf Trip – Reminder! We just wanted to remind you about the awesome Surf- Trip on the Easter weekend! It is the last chance this year for you to get such a cheap as opportunity to go to Raglan with the Mojo-Crew and enjoy a whole weekend full of surfing, fun and entertainment. Meals, Accommodation, Surf-lessons, Surfboard Hire (includes the gear), Transportation, Free Entry to a concert in Raglan on Saturday night! We give you one day for free plus another 20% on the regular price which makes it the incredibly cheap amount of 319(!!!) bucks for the whole weekend. For more information feel free to contact us vial email or check out the previous blog post on internexnewzealand.wordpress.com. We hope you will decide to take this amazing opportunity to go surfing with the funny MOJO-Crew and we hope to see you tomorrow night downtown! This entry was posted in INTERNeX, Internship, new zealand and tagged amazing, beach, beautiful, enjoy, fantastic, friends, fun, Opportunity, Party, raglan, sun, surfing on April 19, 2011 by ixpaul. No plans for the long easter weekend so far?Keen on going surfing?Learning surfing?Improving your skills? As you know the amazing surf season in Raglan will end soon and therefore we have one more special offer especially for you! The Mojo-Surf Crew will bring you out of Auckland down to Raglan for the whole Easter weekend and you will have a great weekend in this stunning little surf location. we have thrown in an extra day for free with free surfboard and wetsuit hire. That means you get the fourth day for free!!! Whats gonna happen? Whats included? How much do I have to pay ? The weekend trip is perfect for all of you who work during the week and want to get away for the weekend. The surf Crew picks you up from downtown Auckland at 6 pm on Friday and takes you to the surf huts in Raglan only 2 1/2 hours away and then brings you back to Auckland on Sunday afternoon. You will stay in a beautiful lodge in the New Zealand bush just a stone’s throw away from the beach. In addition to that you will be fully provided with meals throughout the weekend (Saturday-Monday). If you book with us you will get a 20%discount on the actual price plus one additional day for free! Instead of $399 you only have to pay $319(!!!) for the whole easter weekend(4 days-3 nights,friday evening-monday afternoon) all inclusive!!! Additionally there will be free entry to see 3 live bands play in Raglan town on Saturday night with the locals and an optional Sunday sunset harbour cruise complete with spa pool aboard the Mojo boat the Wahinemoe. A beach soccer tournament will also be organized in amongst the surfing lessons, bush walks and waterfalls! What a way to end an awesome summer season and celebrate Easter in true kiwi style! Do not hesitate to contact us if you want more information or want to book a trip with us. This entry was posted in INTERNeX, new zealand and tagged amazing, away, beach, easter, fun, long, mojo, Party, raglan, relax, special, sun, surfing on April 14, 2011 by ixpaul. After our departure on Friday evening and the 2 ½ hour bus trip we settled into our awesome lodge and all got to know each other before a relatively early night. On Saturday, our international group of 10 people got a full-time program of surf-lessons from our two instructors, we watched one of our instructors play for his local rugby team and we went on a sunset boat trip where we enjoyed the most amazing sunset and a typical kiwi Barbecue. In the later evening we relaxed with quite a few beers and played some pool in the lodge laughing and having a great time. We had the perfect Sunday! After a big long breakfast we watched a local surf competition, where we got an idea how surfing should really look and then everyone used the sunny Sunday in their own way…hanging out on the beach, taking pictures or going surfing again. After a typical fish n chips lunch we started our way back to Auckland and arrived totally exhausted but satisfied and happy about this incredible weekend. Thank you guys for a wonderful time and hope to see you at Rakinos on Wednesday! If anyone else wants to do a surf trip in future, come and talk to us about it and we can book you on a trip, but remember there are only 3 surf weekends left. The last weekend was really successful and awesome. 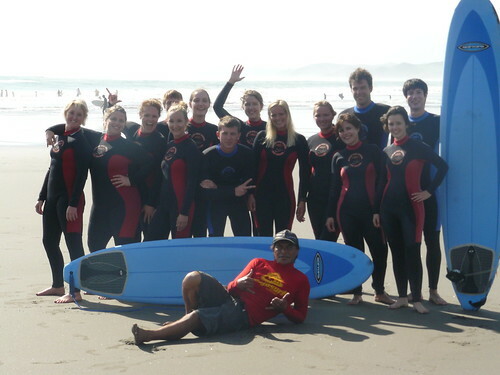 Some of the INTERNeX interns and their friends joined me for a surftrip to Raglan, the surfhotspot in New Zealand. The weather and the waves were really amazing so we had almost the best surf-conditions for learning to stand-up on the board. On the Saturday, our international group of 10 people got a full-time program of surf-lessons from our two instructors, we watched one of our instructors play for his local rugby team and we went on a sunset boat trip where we enjoyed the most amazing sunset and a typical kiwi Barbecue. In the later evening we relaxed with quite a few beers and played some pool in the lodge laughing and having a great time. We had the perfect Sunday! After a big long breakfast we watched a local surf competition, where we got an idea how surfing should really look and then everyone used the sunny Sunday in their own way…hanging out on the beach, taking pictures or going surfing again. This entry was posted in INTERNeX, Internship, new zealand and tagged amazing, friends, fun, INTERNeX, interns, raglan, rugby, stand-up, surfing, weather, weekend on April 5, 2011 by ixcaroline. We already have 5 people for this weekends surf trip and it looks like the weather is going to be good and the surf even better so don’t miss out. You will learn how to surf, make a lot of new friends and have some great parties in one of the best surf locations in New Zealand. The Surf Crew picks you up from downtown Auckland at 6 pm on Friday and takes you to the surf huts in Raglan until Sunday afternoon. You will stay in a beautiful lodge in the New Zealand bush near the beach, including three meals per day. So all together you are provided with an all inclusive weekend surf trip for only $319! Don´t forget about your Good Mood, Towels, Hat & Sunscreen (!! !, Camera, Party Funds) If you cant make it this weekend there are only 4 weekends of surf trips left!! This entry was posted in INTERNeX, Internship, new zealand and tagged awesome, beach, bush, nice, Party, raglan, sun, surfing, weekend on March 29, 2011 by ixpaul.